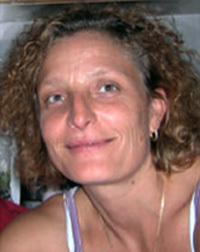 Prem Valeria is sannyasin since 1988 and works as a bodyworker since 1991: physiotherapist, Holistic Massage therapist, Aquabalancer. She teaches in the Osho Rebalancing Training, with specialization in anatomy. "Since I started working on the body, I have always felt the need to give it more depth, to seek the possibility of going beyond the purely physical and meet the people in their entirety. The path of Rebalancing has given me more understanding of myself and others and gave me the tools to be able to act, with great respect and awareness, even on the most sensitive levels. "